What others say about chiropractic care can help you make the right health care choice. Review a selection of In-Line Family Chiropractic testimonials below and please call us, email me or contact the office if you have any questions. Dr Matthew Russell and his team are highly skilled and knowledgeable in their field of Chiropractic treatment. The courteous and welcoming staff make myself and my family feel comfortable and welcomed. “My name is Jennifer, I am currently 29 and was diagnosed with Degenerative Disc Disease in January of 2015. Let’s start from the beginning. In September of 2014 I woke up with lower back pain and just shrugged it off and went about my week. As the week ended, my lower back was so tense I decided maybe I should go get a massage to loosen my muscles. After my massage, my back continued to get worse until one day in late November I could not even get out of bed it hurt so much! I went to my family doctor and he prescribed me pain medication, put in a referral for an MRI and sent me along my way. Fast forward to Mid-December. I had been going back to my medical doctor, visited the emergency room a few times and they always just sent me on my way with more medication and too consider seeing a physiotherapist. At this point I was barely mobile. I couldn’t sit, stand or walk and when I did it was so painful I would just stay in bed all day. I started physiotherapy 3 times a week and had no progress whatsoever. I then visited acupuncturists and massage therapists and nothing worked for me. One day I thankfully met one of the doctors at In-line! I already had my MRI, was diagnosed and I was waiting on my results when I spoke with the doctor from In-line about my back and she urged me to come in for them to take a look. I won’t lie I was VERY skeptical because I had tried absolutely everything else and nothing had eased my pain. The day I was scheduled to visit there was a big storm and I had just brushed off the appointment, and then I got a phone call from Christie reassuring me to reschedule and come in. Oh my gosh am I glad I did! In-line saved my life! I could go on and on about my story and how much I had given up on ever getting better but there is no need. I’ve never in my life met a staff that cares about their patients so much; it’s an amazing feeling to walk into a place where they make you feel at home! I started with 3 times a week with Dr. Matthew in February and I will be down to once a week this coming week (June). I now walk straight with minimal pain (no assistance or cane), I am now able to work again and enjoy my life (which I had thought was pulled out from under me). I look forward to my visits with In-line. It has become a routine and every time I walk out of there I feel like I’ve won my life back. I am forever grateful and will continue to spread the word about how amazing each and every one of the staff is and how much In-Line has educated me along the way. 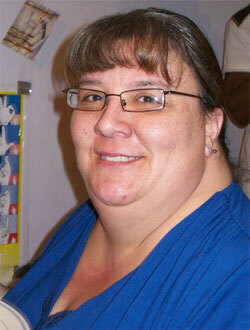 “I was introduced to chiropractic care by my husband. I had low back pain and I was in bed at that time. My first chiropractor was one of those who work on reliving aches and general symptoms. My pain went away, I was feeling much better but it was not enough. Now I know he did not fix the problem he put a “band-aid” on the symptom. I do not blame him, he did his best but it was not enough, my pain came back. I met Dr. John Zeni at Sears in Oakville Place when he was giving talk there three years ago. At that time, I did not have only low back pain but also I got injured and suffered from constant shoulder pain. Dr. Zeni explained in detail what chiropractic care was really about. He explained that the body was designed to heal itself. Everything made perfect sense. I agreed to a spinal examination and guess what…I saw a picture of “my friend” osteoarthritis. I did not like it at all. I started coming to Dr.Zeni’s office three days a week and now just one day a week. Today I have less pain, my shoulder feels stronger, and my balance is improved. I have learned one more lesson: we have to be patient and keep in touch with our Mother Nature. Common sense tells us that to maintain health and live longer we must do some things regularly and consistently. To be healthy, we must eat nutritious food each day, exercise, love, etc. This takes more effort than eating hamburgers. Similarly, regular chiropractic care takes some time, effort and expense. So I am a gardener, I do yoga, I see Dr. Zeni every Monday and sometimes my physiotherapist. Those things help me to stay healthy and in touch with Nature. They are my Chinese Wall. I like to say I have my little world and Chinese Wall around it. “I have put off writing my story for so long, but I know I now have a reason to have my little say. I first met Dr. John and his team about 2 years ago. I was fortunate to go back home (South Africa) for 8 weeks and you guessed it; I missed my weekly ‘fix’ with Dr. John. By the time I got back I felt like a wreck again and could not wait to get my weekly “fix”. After the first session I felt so much relief and look forward to being ‘in-line’ again soon. An important thing I have noticed with me is my eyesight has improved over the last 2 years and I am feeling so healthy and relaxed. When one sees the progress on the x-rays, you know that you have made an excellent choice by coming for your weekly ‘fix’ with Dr. John. I want to encourage those who think it is a waste of time or feel they aren’t benefitting, don’t give up. You will feel and see the benefits you will miss if you give up your weekly ‘fix’. “I have suffered from Trigeminal Neuralgia for 7 years. It is a neurological disease that causes a lot of pain in my face. I have been on every drug from OxyContin to anti-seizure drugs. I have lived with pain on both sides of my face for years and I have seen 2 neurologists, both who gave up on me! For the past 4 years, I have seen a medical doctor at a pain clinic in Mississauga. I’ve had 4 needles in my face to try and block the pain. Before I met Dr. Matthew, I was taking 90 OxyCodone pills in a 90 day period. I have been so happy with my results with Dr. Matthew! After my first 6 weeks of treatment, my facial pain is less than half and I have had to take maybe 1 to 2 pills per week instead of 7 per week! There are still times where I have to take a few over 2 or 3 days but for the most part I feel so much better since Dr. Matthew has been adjusting me. “I have been a patient of Dr. John’s for about 3 years. He has been an angel put in our path to help change our lives forever. Let me start from the beginning. My wife and daughter were shopping with me at Oakville Place. We walked up to a demonstration booth that Dr. John was just starting. We asked him and his lovely wife Mandi, what they were doing with the booth. He stopped what he was doing and started to explain some very interesting ideas about the spine. He said with a quick assessment he could tell how his program would help benefit myself and my family. He asked me to stand on two scales as straight as possible. There was a 20 kilo difference between my right and left hip. My neck was curved like an “S” rather than like a “C”. Dr. John was very concerned. He wanted to know if I had any pain in my neck, shoulders and lower back. I responded that I had constant pain in my neck and shoulders and I couldn’t grip strongly with my hands. My lower back was in constant pain. He said it was imperative that I come to his clinic to have a full assessment to determine a treatment plan. My wife and I agreed to go to the clinic for an assessment. Dr. John took an x-ray of my spine and the results were chilling. My wife cried as he explained that my spine was in a phase 3 condition. He told us that we needed to go to the clinic three times a week to start to correct the problems that I had with my spine. As we started our treatment program, I started to feel a change in a very short time. I felt less pain in my neck and shoulders. The strength was returning to my hands. My lower back started to loosen up. The improvement that I made over the next year was dramatic. The results showed a huge difference in my condition. My neck was now closer to a normal “C” curve. When I stepped on the scales there was a five kilo difference between my hips. I wasn’t in constant pain. The strength returned to my hands. I had flexibility that had been lost for many years. This was all done without pills or potions. By using gentle corrections, Dr. John has given me back my life. I can now function more normally. My family is also being treated by him at the clinic. I have been talking about how Dr. John has helped us. He also has a support staff behind him. This wonderful team of individuals have come together to help improve the lives of many people. They welcome you warmly when you arrive and if you need to reschedule, there is no problem. You feel right at home from the time you enter until you start on your way out the door. My family and I would like to thank God for putting these angels in our path. You have made us feel part of your healing family. Our health has improved. Our lives will never be the same. Please accept our gratitude for giving us a choice to improve our quality of life. All of this was done without surgery or pills. By correcting subluxations in the spine, our bodies can heal. We will continue treatments for the rest of our lives. “Up until the age of 35 and after having a second child, I have been living a rather healthy pain free life. Until I started noticing my heels hurting for no apparent reason, I tried to find a reason for it but there had been no change in my lifestyle that would explain this new pain that I was experiencing every morning. The pain was very sensitive and made getting up and walking in the morning very painful and difficult. Turns out it was a case of plantar fasciitis. Since I had no explanation for developing this condition it had me wondering “Will it be like this for the rest of my life?” Two years pass by and pretty much every morning I woke up with hurting heels so I just learned to live with it and walked with the pressure on my tippy toes in the morning to avoid my heels touching the ground. Come 2014, my dad recommends seeing a Chiropractor at In-Line Family Chiropractic, not for the plantar fasciitis and not for any reason in particular but just for a check up and improving the overall quality of my life. After receiving treatment from Dr. Matt for only a month and a half I noticed something different, I noticed my heels weren’t hurting AT ALL in the morning any more. The pain and discomfort I had totally disappeared. So besides all of the benefits of having my spine adjusted and maintained, as a by-product of the treatment my plantar fasciitis had been cured! From wondering if I’ll have to deal with this pain for the rest of my life to it totally going away has drastically improved my quality of life! I no longer wake up and start my day with pain as the first thing on my mind. “I must confess that I went into see Dr. Matthew hesitantly and somewhat reluctant to believe chiropractic care could or would help me. After 15+ years of seeing a massage therapist, acupuncturist and seeing another chiropractor for a couple years, I honestly did not believe this would help me. I was taking at least one bottle of extra strength Advil per month, to reduce the head tension and neck and back aches. I must also add that I’m a runner, bike rider, golfer, gardener and I don’t spend a lot of time sitting around, so movement without pain is really important! Well, I’m now into my 11th month of corrective care and I am a believer for sure! Actually, it did not take me 11 months to figure this out; change was noticed fairly quickly, around week #3 or so. My Advil consumption is almost zero now! I do take the occasional one if needed, but certainly nowhere near the level it was before. My balance has also improved greatly over the year! “A year and a half ago, I had been suffering from severe back and neck pain. It didn’t matter what I was doing; whether I was standing, sitting, walking or lying down, the pain I was experiencing brought frustrated tears to my eyes. After unsuccessful attempts to alleviate the pain through physiotherapy, massage therapy, and yoga, I came upon a promotion offered by In-Line Family Chiro. I decided to try it out and I am so glad I did. I have been under the kind and attentive care of Dr. Matthew since and have felt a tremendous amount of improvement. I no longer have neck pain nor do I get the painful back spasms I use to frequently experience. Also, I am able to sleep through the night which I couldn’t do for a long time before seeing Dr. Matthew. “I was 7 months pregnant and I hadn’t heard very good things about chiropractors, but for some reason everything Dr. John talked about that day made a lot of sense. I called to make an appointment for myself and asked my husband to come along. We were very surprised. Once we were educated about chiropractic corrective care we knew that this was a common sense approach to overall health! We have been under Dr. John’s care for about 5 months and we both feel great. Historically, our winters have been miserable because one of us is always sick with a cold or flu, but not anymore. My husband is finally on the road to having healthy knee joints, which have been a problem for years. I had a great delivery and gave birth to a healthy baby girl, Diya. The only issue we had was that Diya had been suffering with colic, which consumed our lives for the first couple of weeks. That was until Diya had a check-up and her first adjustment with Dr. John. Her colic improved right away! Thanks to Dr. John, Diya is now colic free. In addition to the wonderful care we are receiving, we are constantly being educated on exercises we can do at home and other health topics that we can apply to our daily lives to benefit from optimal health. What we like best is that we can talk to Dr. John about any health issues we have, and it is comforting to know that he cares and tries to help in any way he can by offering natural holistic alternatives. “I was very skeptical about going to the chiropractor as an adult, even though I’m already a success story. When I was young, wetting the bed was a huge problem for me. My whole family made it a routine to go to the chiropractor and shortly after, my long-term issue completely disappeared. I couldn’t believe it. At the beginning of 2014, I didn’t think anything was wrong with me. No serious symptoms or pain. Luckily, I was referred by a loved one and received a full examination from Dr. Matthew. I did fear a couple things – the truth and the cracking. I quickly learned at the Doctor’s Report that there was no need to fear anything; I was where I needed to be. I found out that my head was forward three and half inches! I also had much more weight on one side of my body. This explained why for years I had been sleeping with my head stretched downwards. Keeping my head and body straight while lying down was extremely uncomfortable. I was excited after my first adjustment because I did not experience the scary cracking, instead it was comfortable and quick. I also had the best sleep I’ve had in years! Ever since the beginning of the year, I have noticed a huge difference in my posture, sleep, mood, ability to stand for long periods without being sore or tired, and my energy levels have increased! I am forever grateful that I didn’t stay a skeptic about chiropractors and I am on the right track to a healthy subluxation-free life. “I was first introduced to Dr. John and Jessica on a very windy day in the fall during a street festival in Bronte. John was providing introductory chiropractic assessments at a great deal. Just as I was about to be examined their display started to blow away-it was VERY windy! Dr. John and Jessica handled this state of affairs with such grace that I decided that I would make a visit to their office. Years of lower back pain and neck tension and a desire to be as healthy as I could, were also a driving force. Whether I would continue with chiropractic treatment was still up for grabs and I was just going to be open to new ideas but also be vigilant not to do anything that would not be good for my body. Dr. John and his staff spent a great deal of time educating me about his special kind of care. Subluxations have become a part of my vocabulary. I started to understand how my anatomy worked and how chiropractic care could help. The tangible results are clear. I have my energy turned on. I have learned that I can trust Dr. John and his staff and that they have character and a genuine value to improve the lives of others. I like being surrounded by their attitude and their skills and knowledge. I am more flexible and have not experienced severe back pain since starting. Quite remarkable as I have just moved and probably lifted way more boxes than I should have. For me, Dr. John and his staff combine what I need- an interest in treating the whole person and providing an environment which promotes growth and health and well-being. “I was driving my brother Paul to do a reptile show. As I waited, I decided to go to the Burlington Mall for a walk. Dr. John was set up at the mall to give people chiropractic assessments. I filled out the paper that Nora gave me so Dr. John could know what was causing my grief. I made plans to get an x-ray and find out what Dr. John could do for me. I told my daughter my plans and she asked to come with me. She wanted to see if he could help her with her shoulder. I found out I was far into phase 2 and Caitlyn was in phase 1. My husband Reno (phase 3) and son Brodie (phase1) also now come to be aligned. 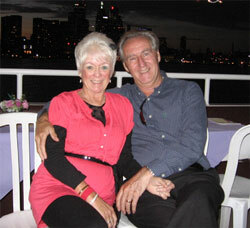 “I first met Dr. John a couple of years ago while wandering around the Oakville Waterfront Festival. I stopped off at the In-Line Family Chiropractic display booth because of my chronic neck pain. I was very interested in what they could do for me but was not convinced that anyone could give me relief and increased mobility for my stiff neck. Anyway, I gave it a shot and after a few months my neck felt great. I could turn it without moving my whole body and that heavy, weighted feeling was gone! By then it was winter, driving conditions to and from the office were getting particularly bad and I could no longer keep up my commitment of three times a week so I gave up. A year and a half later I’m back because of similar problems with my neck and back. This time I’m back because my husband got very tired of my complaints. Within weeks again I saw improvements and I know Dr. John is very happy with my progress. So, with great support from my family and the increased energy and zest I have as a result of treatment I am motivated to continue! “I have been asked to write my chiropractic story on behalf of Colin, my husband and myself. Colin has been attending chiropractic procedures for a long time due to back troubles but in the past it was a much more physical procedure, according to him. He has now arrived at a point where his back pain and sciatica are manageable and he can live a normal life. Since being with Dr. John approximately three years now, the chiropractic procedure to align your spine is not at all painful as in the past. After my husband started treatment I came along to one of his subluxation seminars and it certainly made sense that if your spine was aligned then everything else in your body would be working properly. I myself had been in two car accidents thanks to traveling to Guelph each day on the icy winter roads. On one occasion I turned my car upside down and was knocked unconscious landing on my head, consequently my head was knocked down into my shoulders. I decided that chiropractic procedures would help me get aligned again and though I suffer from high blood pressure, diabetes, and also cancer, everything is controlled and I have been perfectly well throughout chemo. I do believe that looking after your body in this manner helps you get through whatever illnesses come along. I also dance and keep active and all this combined with a positive outlook helps us to keep on the right track. 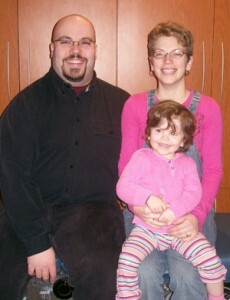 “Good friends of ours referred us to In-Line Family Chiropractic several months ago. 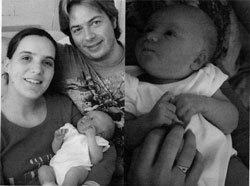 I was very excited to begin as I had just found out I was pregnant with our first child. I was interested in receiving treatment to promote a healthy pregnancy and to correct some back pain I was already experiencing. Within a few weeks I noticed a big improvement in my back pain and was able to sleep and function everyday more comfortably. My husband was a little reluctant in the beginning, but he started to notice that he wasn’t getting sick as often. His usual fall cold never came. He also had an incident where he had hurt his back. At the time, the office was closed for a week and he was in serious pain. It took him fifteen minutes just to dress himself in the morning. As soon as the office was open again he received treatments and within a few days he was back to normal. He was impressed that he didn’t have to resort to taking strong pain or anti-inflammatory drugs to find relief. On February 14th our daughter was born. The labour went relatively well, but she was coming out slightly sideways and she struggled after being born with her first few breaths. After birth, I had trouble getting her to breastfeed well. I noticed that she wasn’t opening her mouth very wide. I felt that the trauma of birth could have pulled some muscles or caused problems with her neck. At three days old, we brought her into the office for her first adjustment. By the end of that week, I had noticed a big difference in her ability to feed and to open her mouth. Even my Mom noticed a big difference and now promotes chiropractic care to her friends. After two and a half years of adjustments, my neck is almost in a perfect position and the hump on my back has gone down quite a bit. I now can turn my head easily and my hips are more lined up. “Our story begins with a chance reading of a street side sign. It was a posting for a ‘Mom to be Expo’ being held at the Burlington Convention Center. The event was for that particular evening, so we went not really knowing what we would find. What we found were lots of pregnant women in all stages of pregnancy. There were booths set up all around the room and, as we slowly followed the line ahead of us, we came upon Dr. John and his team at the Chiropractic booth. We were greeted with smiling faces not only of the doctor, but of a very excited patient. She told us her story of chiropractic care during and after pregnancy. This alone perked our interest in what was going on with Sherilyn, as she was only in the beginning of her second trimester and already experiencing back and hip pain. We spoke with Dr. John and made an appointment to come out to the clinic for a full exam. This is when it got really interesting. We were expecting a scan of some sort and then an “adjustment” on the table and that would be that. We would come back each week and feel better. Well, we got, and continue to receive, way more than that. After the first exam, we were invited to come back for a follow-up report. It was at this time we learned about subluxations and the various degrees of spinal degeneration. We came away from that meeting with a different outlook on chiropractic care than when we went in. It was almost immediate that father and daughter joined mom in receiving care. Rather than treating the symptom, a headache, or sore shoulder, we were correcting the cause, our spines. We have noticed quite a bit of change in what seems like a short amount of time. The pain that my wife was feeling so early in pregnancy is gone. Being able to pick up and hold on to a two year old who wants her mom is very gratifying. This simple joy was quickly turning into agony before we started correcting the subluxations of the spine that we had learned about. “When I decided to write a story about my experiences with chiropractic after being a patient for 6 months; I put it off, not wanting to copy other comments I had previously enjoyed reading. I mean, I felt the same as some. I marveled at the recovery my daughter had made after suffering from chronic back problems for years, but still felt I had no reason to go to a chiropractor. I did have a frozen shoulder but had endured physiotherapy and thought I was as good as I was going to get. I was surprised when after a few months I was pain free and became as exasperating to others as a reformed smoker. I was telling everyone that they needed to go to my chiropractor and what a wonderful place In-Line Family Chiropractic was. Now, after more than a year, I find myself in a different state of mind. I know my posture has improved; I am more in tune with how my body feels, and how it responds to daily pressures and stress. I find I look forward to the peace and tranquility of the office as well as the actual adjustment. Dr. Zeni likes to “turn on my power” and I’m sure he really has no idea how right he is! The difference between walking into In-Line and leaving is truly astonishing. I find little things like my approach to my staff at work, is much more calm and friendly, and my energy level for the day has improved considerably. When aches and pains do appear, I make mental notes to discuss them with Dr. Zeni and have confidence that he will attach as much importance to new problems as he does with my initial pain and concerns. Several years ago, I experienced a critical health scare and one of the outcomes, was to promise always to be very kind to myself. I find ways to relive stress and find little areas of calm and while I am not in the best of physical shape, for the most part, I believe I am a happy person. Now together with the team at In-Line Family Chiropractic, I know I always will be. “A trip to Wal-Mart turned into a life changing trip for me. I met Dr. John there and agreed to have my spine checked as I had suffered with back problems since I was a child. My husband and I sat in on an educational meeting at the In-Line Family Chiropractic office and were soon convinced that being treated was the best route to go. That was several years ago and I am now very happy to say that my body has responded to treatment amazingly and I feel much better than I have in years. I have more energy and am able obtain the goals that I have set for myself. I have learned that continuous treatment can improve my overall well-being. The positive attitude and friendly, caring atmosphere makes In-Line Family Chiropractic a very pleasant experience. I feel blessed that I was led here to pursue treatment. I would advise anyone to give it a chance before saying “no”. They’ll soon find that chiropractic care is the way to better health and happiness.